THROWBACK! The Femcee, A Dynasty Indeed! Our first interview for BSR was an Interview with Dynasty, The Femcee from Tampa, Florida. Emcee Artist of DJ Sandman and DJ Young Deacon from TampaHipHop.com. BootSlapRap.com Catches up with her for some words. From the streets of Queens, NY to the sun-bathed population of Tampa, FL; most of you should have already heard of that one they call "the femcee." Her introduction to the game was definitely a natural progression, and her story is one that increasengly gains movement on Hip Hop's list of the most beloved emcees of the time. Her feminine swag is matched by her ability to engage a crowd in her very own story within a culture that most had thought lost honor and dignity. We caught up to Dynasty and had her agree to share some thoughts with us, and answer some questions that we could provide our readers. We asked her how her journey has been since her proclaimed "awakening" into the local arena, when she performed at a Little Brother show in the historic Ybor City District of Tampa Bay. BSR: So, tell us how has your journey been from the Little Brother show in Ybor to now? BSR: What started you rhyming prior to then when you lived in Queens? Any favorite throwback emcees? DY: Well, it was just something I started doing because the boys were doing it. Me and my girls would take rhymes and switch them up to make it our own. My favorite group at that time was Das EFX. All I wanted for gifts were Das EFX tapes. (LOL!) After a while, I realized that I was pretty good at it, and once I got a taste of the stage, it was a wrap! BSR: What lessons have been the hardest to learn for you in this game? DY: The hardest lesson was that this thing really takes work! It's not just about being a dope emcee; (and) just because you're good at one aspect of it, doesn't automatically make you good at another (aspect). For example, recording was never natural for me. I always considered myself a PERFORMING artist (because) THAT comes naturally (for me). Standing in a booth, in front of a mic, not so much. That really took work for me to conquer, and I still feel that I have work to do, but I am growing. BSR: What is a victorious moment, and what is a dissappointing moment you have had at a show? BSR: So, being from Queens, how do you feel the music in Tampa differentiates from your hometown? DY: They have quite a few artists down here doing Jook music, which is different than what we do up north. But, truthfully, Tampa is a melting pot and a lot of people are here from all over (the place). So, it's a nice variety in the music scene here, not just in Hip Hop, but ALL genres. BSR: Since everyone keeps asking this, we felt we probably should appease the masses but ask it a bit differently. Where do you see Hip Hop heading in regards to production, lyricism and the business as a whole? DY: I'm not really one to speak to much on the business side. My concern lies with the art itself, and right now I see people looking for a little more variety. The dance music is cool, the money, hoe's and clothes flow is still alive and well; but people are looking for MORE. I think people embracing artists like Jay Electronica is evidence of that. BSR: So, who's spinning in that music list of yours these days? DY: Oh man! My music list is so random!!! It will go from Erykah (Badu), John Mayer, Mos Def, Gladys Knight, Adele, to Slaughterhouse. (LOL!) Whatever I am in the mood for, I find it… and listen. BSR: Who has shaped your experience thus far? Is there anyone who has had an impact on your style, approach or views? DY: The artists who influence my views are artists who are true to themselves like Erykah Badu and Mos Def; and the list grows as I'm exposed to more music. Any artist who doesn't compromise who they are to appease anyone impacts me. Authentic artists encourage me to keep doin' what I do! BSR: How did the "Dreampusher" concept come about? DY: I felt that this project was my introduction to the world, and I needed to let people know who I am. A "Li'l brown girl from queens with big dreams." I'm a "dreampusher", doing what I have to do day to day to get by, but I know where my heart lies and what my dreams are. That's what I push for. BSR: So, when can we expect the LP? Any signs of that in the horizon? BSR: So, are you keeping it independent, going for a signed deal or not sure yet? BSR: What would you say to any aspiring artist in this Hip Hop game? DY: You already know what I'm going to say… keep Pushin'! I know that may sound cliché to some, but it is TRULY my mantra and it gets me through everything. Pushin' forward has brought me to where I am now, and it's going to take me far beyond here. This is just a stepping stone. BSR: Any other thoughts, shoutouts, etc? DY: Shouts to my team, TEAM DY. Sandman, Jinx, Deacon, DJ Fader (The Rotten Orange), and anyone who supports me in pushin' for my dream. I appreciate you! 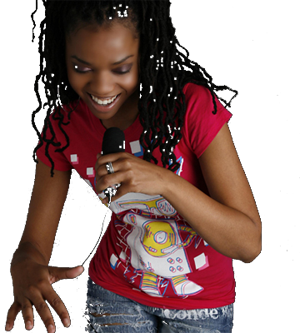 Be sure to stay in touch at thefemcee.com and http://facebook.com/thefemcee! Want more information on Dynasty (aka Ya Girl DY! ), the Femcee? AYCH came by the lab to talk about his upcoming release, POWER, which we got a preview on. imagiin360 discusses the concept, some of the tracks and AYCH's outlook on life, music and his overall goals. After catching up with Rook Da Rukus, we finally got some words from him on life, music and future plans as well as old connects. Check out the video and share the link with your friends and social networks. So, we caught up with the infamous Larcen at the URUP showcase early November, and we got him to speak on his latest project, "Good Morning, Get Money," his future plans and some insight from him on the game overall. Peep our the first BSR Video Interview! © 2013 - 2019 BootSlap - All Rights Reserved.